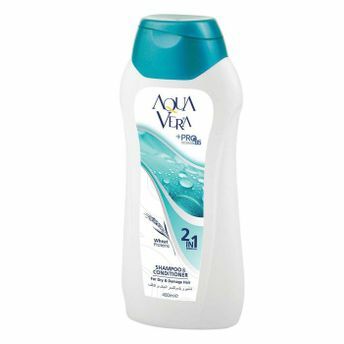 Aqua Vera 2in1 Shampoo For Dry and Damaged Hair cleanses hair, makes your hair easier to comb and preserves the scalp's normal balance. The rich Pro-Vitamin formula intensely hydrates and restores to leave hair noticeably softer and smoother. Formulated with wheat protein and blended with soothing and moisturizing agents to prevent static electricity, protect from UV rays and thermal effects. Additional Information: Beyaz Cosmetic is a manufacturer of high quality perfumes and personal care products under the registered brand name Aqua Vera. Aqua Vera range of products include perfumes, liquid soaps, shampoos, hair conditioners, shower gels, intimate washes, baby care products and antibacterial hand sanitizer gels as well as some home care items. All the products are designed and manufactured by the well experienced and professional staff in accordance of the most up-to-date technologies.